Kids Can Press, 9781554536412, 120pp. In Front of My House is a whimsical celebration of a child's imagination and all the places it can travel. This circular story begins and ends in a tidy front yard, but in between takes the reader to mountains and mysterious caves, up to outer space, down into the ocean and beyond. It's a journey as boundless and surprising as young imaginations. Filled with inventive and delightful twists, this charming story reveals a child's fancy taking flight, showing how imaginative play can begin in a place as mundane as a front yard, reach to the stars, then return back to the same place. Children will recognize a kindred imagination in Marianne Dubuc's joyful illustrations and simple text. 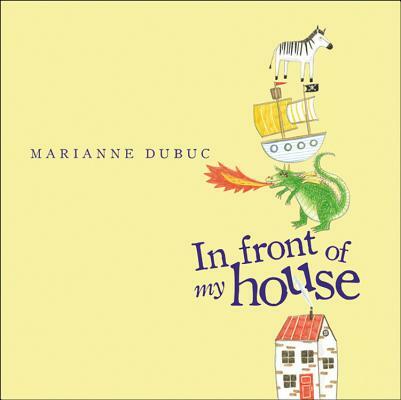 Marianne Dubuc wrote and illustrated In Front of My House, which was nominated for the 2011 Marilyn Baillie Picture Book Award, and The Bus Ride, which received the 2015 TD Canadian Children's Literature Award. She lives in Montreal, Quebec.